We would be delighted to be a part of your big day! 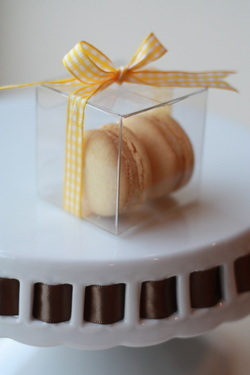 Our boxed wedding favours are fully assembled for your convenience. Min. order of 40 favours. Kindly allow four weeks advance notice. 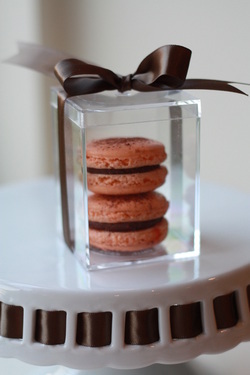 A very modern yet elegant way to present your Macaron favour. 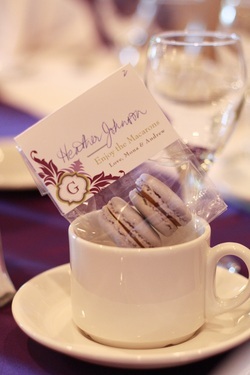 Idea: You can even make a very small place card to attach to the top of the chairs to direct guests to their seat. 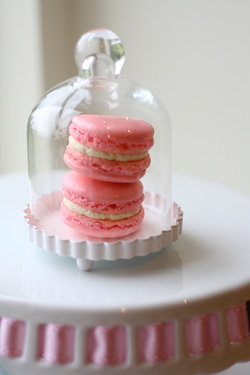 Two Macarons enticing you through the Glass Dome. $10. Base: is a triple footed, finely painted white metal base. Click here to see the Place Card styles. Ribbon selection: 7/8" organza, satin in 3/8" or 5/8", 3/8" gingham or 5/8" stitched grosgrain. Personalized ribbon will be an additional charge. Click here to see the ribbon colours. Like two gems in a jewellery box, our luxurious Milano box is the perfect accompaniment for these delightful morsels. Click here to see box choices. Planning a dessert table or a dessert buffet? 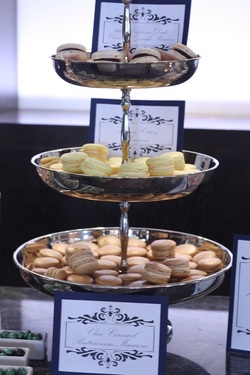 You can display up to 120 macarons on this magnificent five tiered display stand. 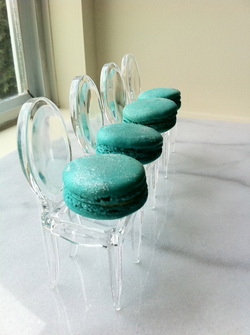 $2 per macaron plus $50 for rental of silver stand. Kindly note: Dessert signs are not included.